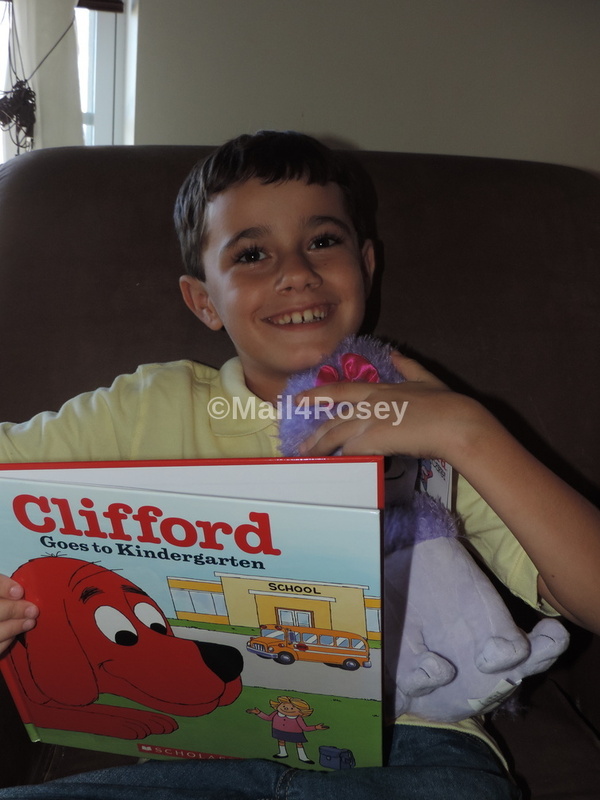 Mail4Rosey: #KohlsCares Back to School with Kohls and Clifford! #KohlsCares Back to School with Kohls and Clifford! Koh's is always a favorite destination for back-to-school. I get my son's uniforms there, and I often get his new shoes there too. One thing we never pass up when we're in the store is the $5 Kohl's Cares merchandise. This area always has the best books, toys, practical items and stuffies. Every item costs just $5 and 100% of the net profit goes towards funding children's health initiatives nationwide. 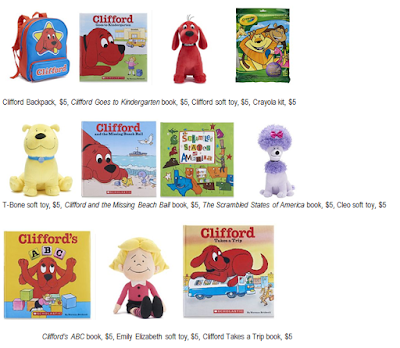 Right now they have Clifford the Big Red Dog items. My son flipped a gasket when he saw them. And let me tell you, he won't touch a pink notebook for school, but he was all over the purple Cleo. He said Clifford's got to have his best friend around, lolol!! If you visit here regularly, you're not surprised. My son is the world's biggest stuffed animal fan, I'm absolutely sure of it. :) I like that you can get the books too. What a great surprise duo for the kids...a book and their favorite stuffed animal. That's a perfect addition to back-to-school shopping at Kohl's, and remember you're helping others as well, with every single purchase. The Kohl's Cares line-up is always pretty spectacular, but I've got to say, this is one of my absolute favorites. Now...I've got my eye on that Emily Elizabeth soft toy for my granddaughter. Chances are pretty high I'll be picking one of those up for my little darling when we head out to Kohl's for back-to-school shopping this weekend. Help get your children back-to-school ready with the newest Kohl’s Cares collection featuring Clifford The Big Red Dog, available now through September. The collection includes a backpack, creativity kit, toys, and hard covered books to promote summer reading. The charming stories of the larger-than-life canine focus on kindness and send a positive message to young readers. Parents can also feel good about purchasing the pieces that are priced at only $5 each, with 100 percent of the net profit benefiting children’s health initiatives nationwide. To date, Kohl's has raised nearly $300 million through the Kohl’s Cares merchandise program. To reinforce the company’s commitment to children’s health, Kohl’s has donated financial support to hospitals across the country. The donations fund hospital outreach programs focused on children’s health initiatives and address the specific issues needed most in each hospital’s community. These tailored programs provide vital resources to families at no cost and include topics such as injury prevention, asthma awareness, dental care, and fitness. My boys like Clifford books. They also watch the Tv show to. Aww, my son loves Clifford! I will check out this. I loved Clifford as a kid. This would make a great set! Allison went nuts for that Clifford dog a few years back. Gotta love those really cute Kohl's Cares items. They always have the best things and I love that they support a great cause too! Sounds like the perfect place to get everything you need for the kids! It's awesome that they have a section for books, I always make sure I encourage my kids to read. That's crazy! I didn't know that Clifford was still around! My little niece loves Clifford. I need to do some shopping at Kohl's. I use to read Clifford to my kids. I love Kohl's Cares! It is always fun to see the books and plushies! We get some every year! My daughter used to love Clifford. It was one of her favorite book series. I love to check out the $5 Kohl's Cares products! Such a great deal! I need to visit Kohl's really soon to check out the $5 Kohl's Cares merchandise section. It's so refreshing to learn that 100% of the net profits goes to helping others. I had never heard of this til now. I'm gonna make sure I take my family shopping at Kohl's soon. I always buy anything I need or that I think looks cute from the Kohl's Care line. I love knowing I'm doing some good in the world. I am so glad Clifford made a come back. We love Clifford. Aww seeing Clifford brings back so many wonderful memories! I wonder if my nieces know about him - if not, I'll definitely have to introduce them. I love the Kohl's Cares line. I feel so good knowing that every time I buy something, a portion goes to charity. I remember Clifford from when I was a kid. I used to love those books. Patronizing Kohl's Cares merchandise definitely makes a lot of people happy. It makes mommy's budget happy, the kids happy, and the beneficiaries of the company's health campaign happy too! Who doesn't love Clifford? Kohl's Cares always has some wonderful products that benefit such a fantastic cause. What a great program! I just love Kohls and my kiddos love Clifford. This kid has it made. No wonder he's always smiling. I used to love Clifford! This sounds like such a great program! I always support Kohl's Cares! They have great books & products! 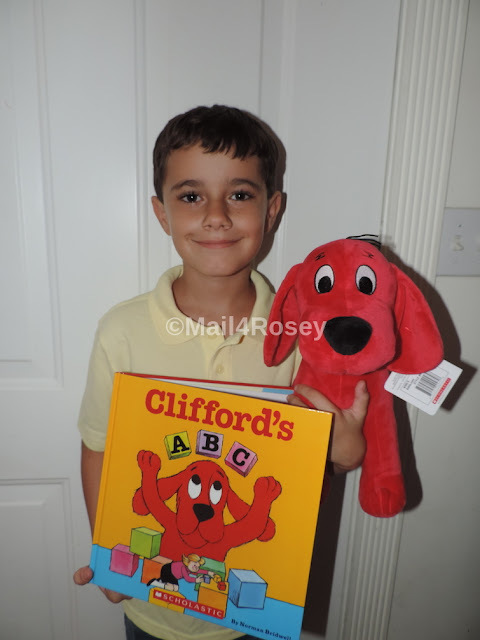 I used to love Clifford, it is great that Kohl's raises awareness and money. I still have the kids Clifford books from when they were little. My Son used to practice his reading with one. I love Kohl's Cares. They are an awesome program and I try to purchase from it as often as possible. My son loves Clifford. I hope we have Kohls here too. I love that they are helping fund hospitals! We had some Kohls Care employees volunteer at our Christmas fundraising event at the school last year! I remember Clifford from when my daughter was little. I had really lost touch with him since she grew up. Glad to see he is still around and helping kids get educated. Love the Kohls book program...always look forward to what they do next and they make great gifts too! Everybody loves Clifford. And Kohls are the best! What a great initative Kohls is doing. I grew up on Clifford! Awwww this is so cute, love the pictures. Clifford and Kohls sounds amazing. My kids love Clifford too! I will have to head to Kohl's to pick up some books and stuffies. Eeek! I love Clifford. I thought about naming my daughter Emily Elizabeth. As expensive as books are, I love that this is all $5 each.. and helps a good cause. It is nice to know that the profit will proceed to a good cause. Nice job Clifford. We love Clifford in this house, I wouldn't think sending my grandchildren off to school with out a Clifford book. Clifford were some of my boys favorite books when they were smaller. I still have all the books! The Kohls Cares Program sounds awesome! I love that these Clifford books are a helping way to give back. This is a great idea for Christmas toy drives. Clifford products for kids, and money for Kohl's Cares. I loved Clifford as a child! I loved Clifford when I was a child and read the books to both my children.